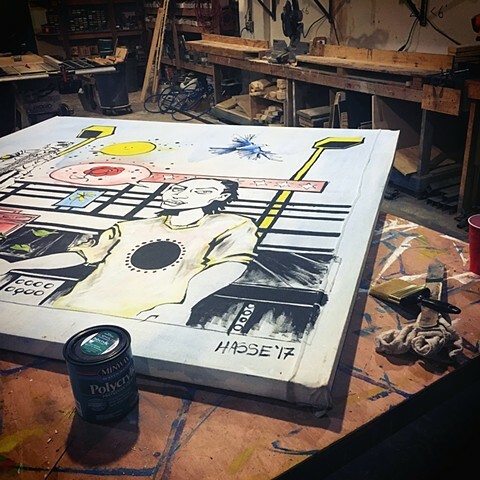 In the spring of 2017, I created a series of three large canvases for permanent installation on the south facing exterior wall of Chicago's Lifeline Theater. As with all my large public work, I depended on the community both to help complete the work and get it installed. The Lifeline’s prop master built my stretcher frames, and the theater also let us assemble and seal the canvases in their shop. A local property owner lent me one of his empty store fronts to paint the pieces; that was especially helpful as I was painting during the month of February! The Lifeline Theater focuses on literary adaptations. With characters from my online graphic novel Freaks' Progress., Storytime shows how the input of different people combine into the beautiful, messy narrative that is our collective story.